In preparation for the Open Electricity Market in Singapore, SP Group needed to transform its technological landscape to empower its customers to make better informed electricity purchase choices in a more flexible market. Together with Capgemini, SP Group introduced enhancements to the SAP™ for Utilities solutions and CRM applications, Business Data Lake, and portals to enable its customers to save and have the flexibility to choose the provider that best fits their needs. In the second half of 2018, Singapore will take the final step in its full transition to an Open Electricity Market, a process that began in 2001 – fully liberalizing the energy market for all customers. For the first time, all electricity customers in Singapore will have the ability to choose the electricity provider that best fits their needs. However, to ensure that customers are able to seamlessly switch between providers, Singapore needed the support of its major energy utilities service provider, SP Group, which is also one of the leading energy utilities companies in Asia Pacific. SP Group understood that it would need to adapt its operations to continue providing the best customer experience to the 1.5 million customers it currently serves in Singapore. 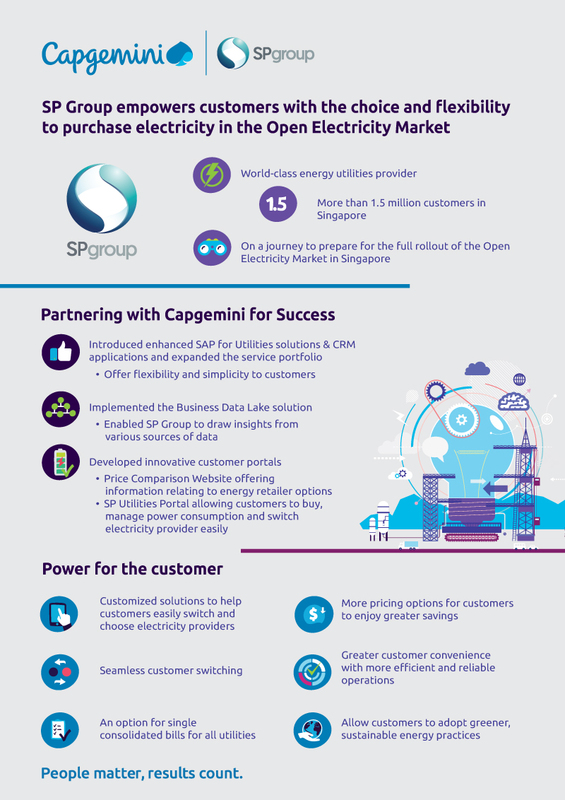 Partnering with Capgemini, SP Group launched a large transformational project that focused on enabling the Open Electricity Market and ensuring that customers benefited from their electricity purchases. Capgemini was chosen due to its deep and extensive knowledge of the energy industry and track record of implementing complex regulatory and utilities solutions for clients worldwide. The team assessed SP Group’s existing processes and operations and determined that it had an opportunity to expand its capacity to manage transactions, support seamless customer switching, and offer more effective billing with enhanced business operations. The business understood that it would need resilient and robust infrastructure and processes in order to adapt to the changes that will come with the full rollout of the Open Electricity Market. and expanded the service portfolio that it could offer to its customers, while ensuring minimal disruptions to its services and business operations. This effort to modernize SP Group’s technical platforms made the organization more flexible, introduced extended and improved security controls, and established a cloud-ready, future-proof infrastructure. To help customers understand their options and switch seamlessly between retailers or to return to the regulated tariff, SP Group and Capgemini built a new Price Comparison Website. It provides customers with access to all information relating to energy retailer options, allowing them to view and compare all plans in the market. To better enhance customer experience, a new interactive SP Utilities Portal was created to allow customers to buy electricity at regulated and non-regulated (spot) prices from SP Group, and view both accounts on a single platform. The portal also provides a simple method for either switching to a new retailer or returning to the regulated tariff. This transformation has laid down the foundation for SP Group to embark on other upcoming initiatives such as enhanced mobility solutions, nation-wide smart meter rollout and greener energy solutions. Capgemini also implemented a Business Data Lake solution to enable SP Group to draw insights from various data sources and provide a single view of its multi-dimensional data models. With the help of analytics tools, the business gained greater insights into its customers’ personas. With this new level of analytical support, SP Group is now better equipped to offer best-in-class services while at the same time helping customers make more informed choices in the Open Electricity Market. SP Group worked with Capgemini to build a new platform that will provide a more efficient mechanism with a simplified billing process, which benefits not only customers but also new retailers in the market. Retailers now have the option to use SP Group’s billing services, which will enable customers to receive a single, consolidated bill for all utility services – electricity, gas and water – and have the option to make online payments. Upon successful completion of the project in 2019, SP Group and Capgemini will create a whole new customer experience designed to support the nation-wide Open Electricity Market exercise. The successful collaboration between SP Group and Capgemini was the result of a strong commitment to achieving the overall vision of the nation: to ensure every household and industry are able to enjoy the full benefits of the Open Electricity Market.